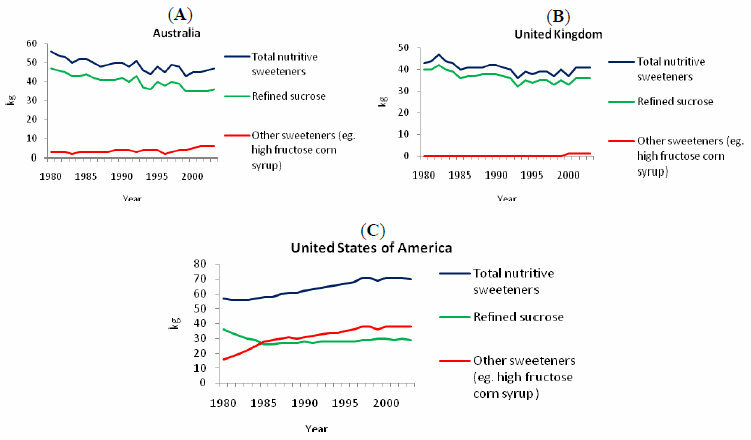 Anyway, I’ve decided to blog about this study — a look at sugar consumption and obesity rates in Australia, the U.S. and the U.K. between 1980 and 2003 — because the information is interesting. It’s by two very well-respected Australian researchers (one of whom, for the record — Jennie Brand-Miller — is a lecturer at the University of Sydney’s medical school, where my wife is studying). It’s in a peer-reviewed journal, Nutrients. And as far as I can tell from the disclosures in the paper, it wasn’t in any way funded by the sugar industry: it was a masters project supervised by the two authors. The only reason the sugar lobby is e-mailing it around is because — as you’ll see — they like the results. Now, population data like this always raises lots of questions. The paper discusses the various ways of estimating sugar consumption, along with their pros and cons, and also breaks down sub-categories like sweetened beverages and so on. Without getting bogged down in all that, I think the important point is — as we should all know by now — putting two graphs side-by-side and saying “Hey, they have the same shape! Graph A must have caused Graph B!” is not good science. The recent debate about Robert Lustig’s “sugar is toxic” crusade has involved a lot of this sort of analysis: added sugar intake has increased in the U.S. and so has obesity, ergo A caused B. But if the trend really is the opposite in Australia (and if anyone can suggest reasons why the data above shouldn’t be trusted, please chime in below! ), then those arguments are considerably weakened. It seems to me that its’ a no brainer. Whats’ so special about sugar that isn’t on offer from any number of other carbohydrate dense foods? An interview on the latest Health Report touches on this conundrum — http://www.abc.net.au/rn/healthreport/stories/2011/3264734.htm#transcript. Ask any diabetic: sugar is just as ‘toxic’ as potatoes. This anecdote underlines the irony: http://diabetesupdate.blogspot.com/2011/07/healthy-whole-grains-just-as-healthy-as.html. It could be the case that instead of less sugar consumption more bread consumption could be as significant or any number of synchronistic factors…To real make a ruling, a study of those very hugh sugar consumers — the Mexicans or the Cubans — would be more relevant. And neither populations suffers obesity rates like the First World. Consider this grossly simplified example of 100 people, where 55 units of sugar is a magic threshold above which a person will be obese. If each person is consuming 50 units of sugar at the beginning, then nobody is obese. One year later, half of the people have cut their sugar intake to 10 units, while the other half have increased their intake to 60 units. Obesity is now at 50%, even though overall consumption has dropped from 5000 units to 3500 units. The authors have touched on this in their last paragraph on page 500. I think Scott may have hit the nail on the head. Today at the coffee shop I saw an obese mother and her son, about 12 and already clearly overweight. Both of them were sucking down sweet tea like there was no tomorrow. Meanwhile many of the other patrons were clearly active and healthy, drinking coffee or unsweetened tea and perhaps a small snack. Just like there is a digital divide, there may also be a nutrition divide in the U.S. and increasingly in the rest of the world. Stephan Guyenet and other bloggers are always writing about the fat “set point”. Something has caused the fat set point to rise in Australia. What that may be is the mystery. I don’t have any references, but I do recall reading that Australia undertook a campaign to encourage the consumption of polyunsaturated fats over saturated fats, even going to the extreme of replacing some of the fat in milk with polyunsaturated fats. Linoleic acid has been proposed as one of the agents that causes fat set point to rise. @Dave R, @Brian and @MVA: Your comments all link to a similar point: there’s no “paradox” unless we’re assuming that sugar is the Single Great Dietary Evil of our time, as Lustig (and more recently, Taubes) have argued. I’m not convinced that’s the case, which is why I find this data interesting — and NOT necessarily paradoxical. @Scott and @Dave M: You suggest a clearly plausible scenario which could explain the Australian data without contradicting Lustig’s claim that sugar is the main driver of obesity. That being said, if the population-wide data in Australia can be ignored because there may be distinct sub-groups that confound the analysis, then the same caveats must apply to the American data. The bottom line is that, if we believe even the superficial conclusions of the Australian data, then we need to discard population data as a plank in the “sugar is the root of all evil” argument. Surprisingly, the scientific article at hand totally ignored the potential role of refined starches in the Australian obesity epidemic. 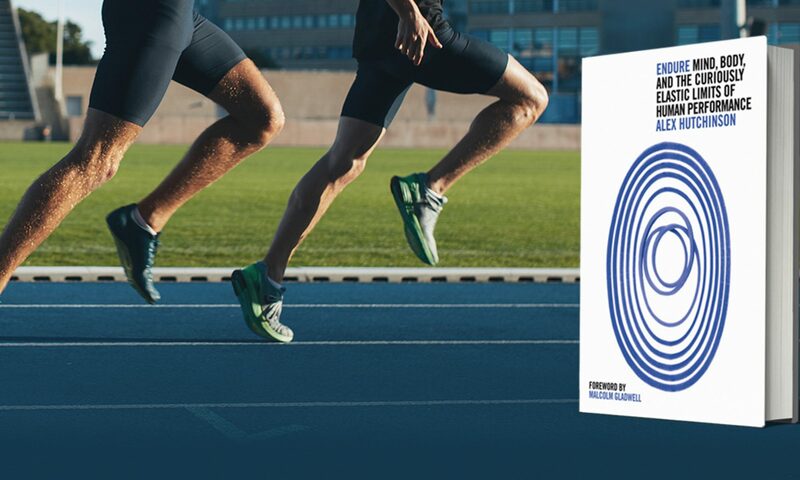 Taubes, Dr. Richard Bernstein, Dr. Stephen Phinney, and Dr. Jeff Volek and I consider the “fattening carbohydrates” to be not only concentrated sugars, but also refined starches. Wouldn’t it be interesting to know the Australian trend in consumption of refined starches between 1980 and 2003? I bet Jennie Brand-Miller has the data. Temporal changes in the glycemic load of weight-gainers would also be interesting. Well, logically if graph A correlating to graph B does not establish causation, then graph A not correlating to graph B does not disprove causation. The relationship between graph A and graph B has nothing to do with cause and effect in an epidemiological survey like this. @Steve: Thanks for the thoughts — I’m quite sure that Jennie Brand-Miller (as a major proponent of the role glycemic index) would agree with you that refined starches in general are of concern, rather than all the blame being placed on sugar. As you point out, that’s consistent with Taubes’s original arguments. But a few months ago, Taubes gave a sympathetic telling of Robert Lustig’s argument that “sugar is toxic.” I think Jennie Brand-Miller’s “Australia Paradox” article is intended to serve as a reminder that (in her view, at least), we should focus on glycemic index rather than just sugar. I suggest you all go look at the following article published today; it may well be that the ‘Australian Paradox’ does not exist. Very interesting stuff, Deejay — thanks for pointing out the article. That certainly raises some pretty serious questions about the “paradox” claim! For the real story on this go to http://www.australiaparadox.com.au. Then google the author Rory Robertson, he has taken a few scalps in hs time and his motivation is simply that the record be correct.